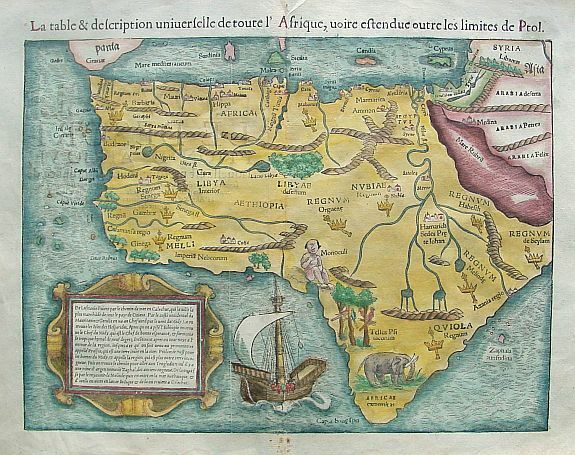 38 M�NSTER, S. La table & description universelle de toute l'Afrique� B�le, 1568. Beau col. Bois grav�. - Wood block print in attractive colours. 266 x 343 mm. 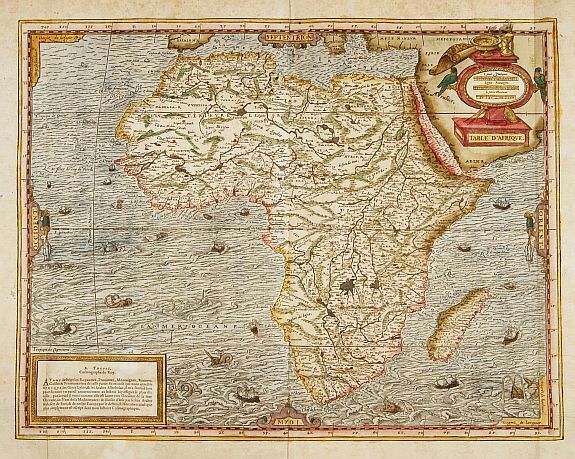 � A cornerstone map of Africa and a map that should be part of any collection of African maps. 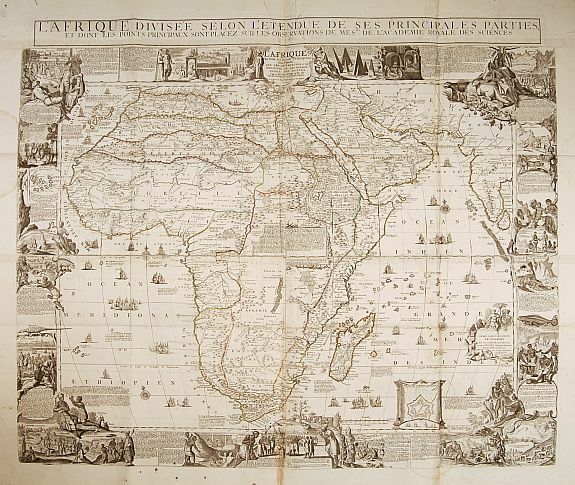 This is the first collectible map to show the entire continent of Africa. Prior maps by Waldseem�ller, Fries, and Gastaldi showed either the northern or southern portion of the continent. 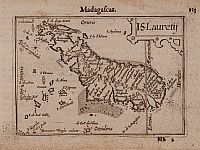 This map is famous for the medieval depiction of the Cyclops. The map also shows an elephant, and various African kingdoms including Hamarich, the capital of the famous Christian king, Prester John. M�nster's map is based partly on Ptolemaic sources (the Nile begins in the two fictitious lakes), partly on Portuguese sources, and partly on Arabic sources. With: AETHIOPIA (sm. Caps) across center of map. - Norwich/Stone, Africa, Map 3. 39 THEVET, A. TABLE D'AFRIQUE. Paris, 1575. Beau col. ancien. Superbe exemplaire en coloris d'�poque, grandes marges. Parfait �tat. - Fine original colours. In very good condition. 350 x 450 mm. 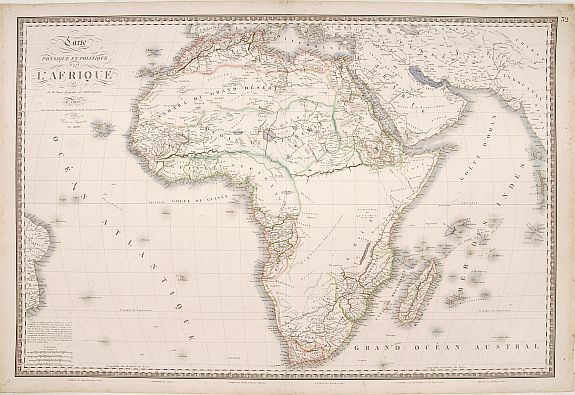 - Tooley, The printed maps of the continent of Africa, 98; Norwich, 12. 44 DESNOS, L. C. L'Afrique dress�e selon l'�tendue de ses principales parties� Paris, 1770. Limites en col. d'�poque. Petits accrocs sans gravit� aux pliures, infimes trous de ver. Bel exemplaire. - Minor tears along the folds, a few worm holes. Origin. Outline colour. Fine copy. Wall map, 4 sheets joined: 965 x 1017 mm. � Rare carte murale entour�e d'une bordure d�corative constitu�e de sc�nes indig�nes. - Rare and decorative wall map including a border with vignettes describing natives scenes. 46 BRUE, A. H. Carte Physique et Politique de l'Afrique. Paris, 1826. Limites en col. ancien. Bel exemplaire. 575 x 850 mm. � The areas belonging to different native tribes are shown more accurately than in many other maps at this time. 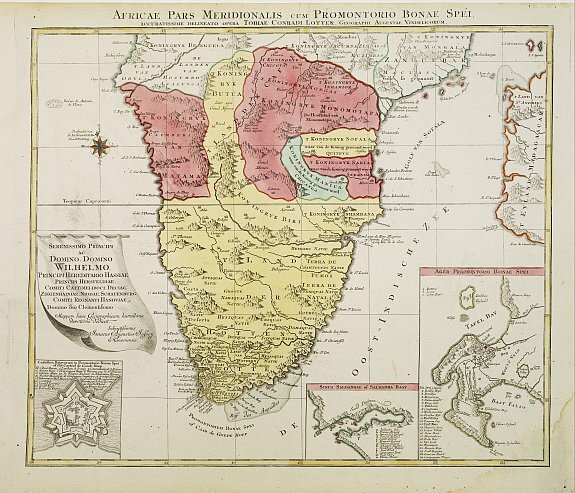 - Norwich's, Maps of Africa, Map 127. 49 PTOLEMEE / BERTIUS. Afr : III Tab : Amsterdam, Hondius, 1618. Papier bruni, fortes rousseurs, d�chirures en bas de carte. 345 x 480 mm. Afrique du Nord et Egypte. Orn� d'une autruche et d'animaux fabuleux. 52 DESCRIPTION DE L'EGYPTE. Edfou. Paris, l'Imprimerie Imperiale, 1809-1813, l'Imprimerie Royale, 1817-1830. Lot de 6 pl. in-folio, certaines d�pliantes. Quelques rousseurs.. The first comprehensive description of ancient and modern Egypt, and the outstanding achievement of the savants who accompanied Napoleon's expedition to Egypt (1798-1801). The work is the greatest of a number of outstanding scientific publications by the French government detailing the results of exploration, unequalled by any other nation during the same period. 57 BLAEU, G. Guinea. Amsterdam, 1638. Col. ancien. Petite fente en bas du pli central. Cadre. - Framed. 386 x 526 mm. 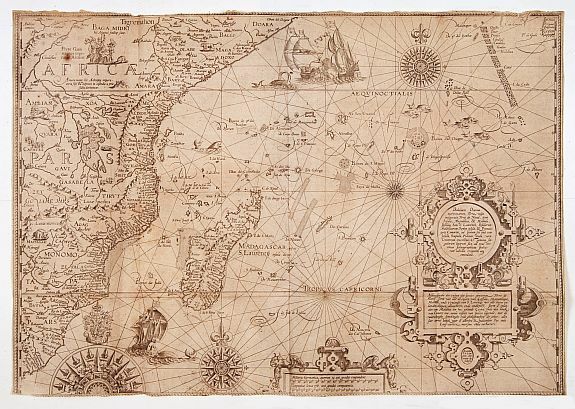 An attractive map covered with intersecting rhumb lines and decorated with monkeys, lions, elephants and native figures. With a dedication to Dr. Nicolas Tulp. 58 LINSCHOTEN, J.H. van. Affbeeldinghe der custen des landts...Terra do Natal... Amsterdam, ca. 1598. Paper slightly age-toned, margins cut short as issued. 384 x 550 mm. 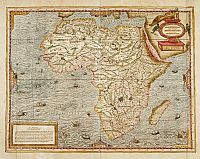 � A highly decorative map of Africa's south-east coast, from Cape of Good Hope to the coasts of Natal and Mozambique with the island of Madagascar included. Upper left the fabled figure of Prester John sits in idealised regal splendour receiving emissaries. With elaborate title-pieces, compass-roses and lettering, engraved by Arnold van Langeren. 59 LANGENES, B. I. S. Lauretij / Madagascar. Amsterdam/Francfort, 1609. Some minor age-toning of paper. Generally in good condition. 85 x 124 mm. 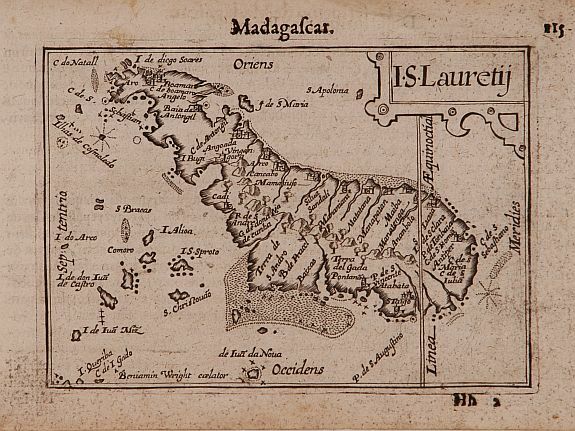 � Early miniature map of S.Laurentius or present-day Madagascar. Title cartouche on the upper right side. First published in 1598 in his "Caert-Thresoor", the plates were executed by the most famous engravers in Amsterdam, including Petrus Kaerius and Jodocus Hondius I. "The atlas set a new standard for minor atlases. The small map is extremely well engraved. The map reflect the level of cartography in Amsterdam at the turn of the century, where up to date information on newly discovered regions was readily available". 60 ALLARD, C. C.D. Bona Esperance. Amsterdam, 1698. Beau col. ancien. Bel exemplaire en col. D'�poque. - Original colour. 223 x 278 mm. Repr�sente un couple du Cap de Bonne Esp�rance. - Published in "Orbis habitabilis oppida" (N� 59). 61 SCHENK, P. Kabo de Bona Esperan�a. Amsterdam, 1702. Beau col. ancien. Bel exemplaire en col. D'�poque. - Original colour. 223 x 278 mm. Vue du Cap avec une flottille hollandaise. - Published in "Hecatompolis" (N� 85). 62 LOTTER, T. C. Africae Pars Meridionalis. Augsbourg, 1770. Beau col. ancien. Bel exemplaire. P�le mouillure dans l'angle inf. droit. 460 x 550 mm. � There are three detailed insets : the Cape Fort, Saldanda Bay and the Cape of Good Hope, all with a detailed identifying legend. 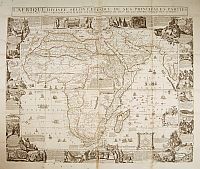 64 LANGHANS, P. Karte des Afrikander-Aufstandes im Kaplande und des Angriffskrieges der Buren. Gotha, 1901. Carte ins�r�e dans une chemise, avec texte explicatif sur la guerre des Boers, page de couverture repr�sentant le G�n�ral Christian de Wet. 530 x 690 mm. Bearbeitet von Paul Langhans. Cette carte relate l'�volution de la guerre des Boers contre les Anglais entre 1899 et 1901. Elle pose en h�ros le G�n�ral Christian de Wet. Joint: Military map of Zulu Land Compiled from most recent information. Intelligence Branch Qr. Mr. Genls. Dept., 1879. 65 x 87 cm. / W. & A. K. Johnston's pictorial bird's-eye map of the Transvaal, Orange Free State, Natal, &c. Lithographed by W. & A. K. Johnston, Edinburgh & London. (1900).